How to purify water with Wood Chip? Did you know wood chip can be used to maintain and improve water quality? All you need is a wood chip bioreactor and be ready to follow established practices to reduce the loss of nutrient. What is wood chip bioreactor? Bioreactors help reduce nitrate excess produced by agriculture and factories. The basic mechanics are quite simple: H2Ois purified when it flows through wood chips (mainly, but also other carbon source materials) before being released to the water. The role of wood chip is to break the nitrate that in other circumstances would be subjected to denitrification process by bacteria. How big are wood chip bioreactors? 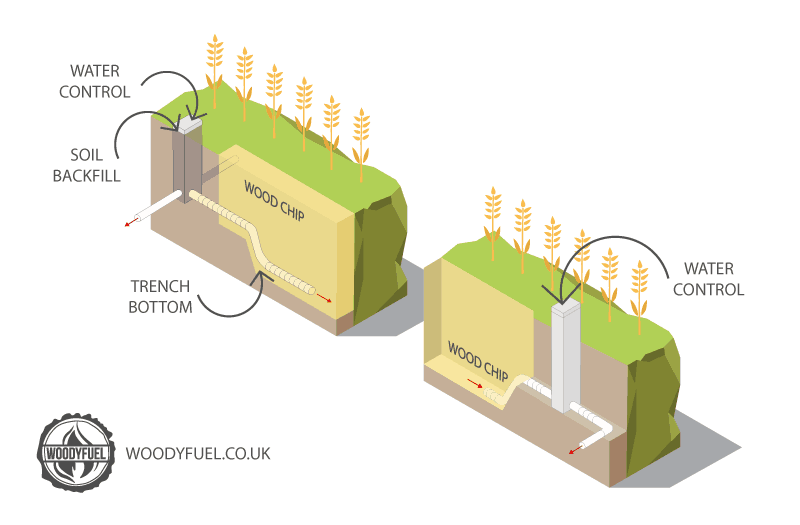 Most wood chip bioreactor installations are 30-40 meters long and 3-8 meters wide. It is not necessary to take out land out of production for a bioreactor. Thanks to long and narrow orientation, they fit well in areas of land under permanent vegetation and grassed. What type of wood chip can I use in bioreactor? We would recommend a good quality wood chip without solid elements. Such contamination can reduce the effectiveness of the bioreactor in reducing the amount of nitrate in drainage. What is the lifespan of a bioreactor and how effective is it? Wood chip bioreactors can run up to 20 years. After that period the wood chip needs to be replaced. Within one year it can reduce between 10 and 90% of nitrate depending on the bioreactor. Providing these denitrifiers with enough carbon to eat and supplying them with an anaerobic condition in the bioreactor you will create a perfect environment to remove nitrate from drainage. If you would like to purchase a wood chip for your wood chip bioreactor, please call us at 03333 447234.